Element sof Dmitry Medvedev's reelection campaign set him apart from Russia's other presidents, but it all could backfire. President Dmitry Medvedev’s passion for social networking as a means of communication, including his experiments video blogging or tweeting, nicely fits his image of a modern, technology savvy, politician. Yet when it comes to delivering important messages, he often falls back on more traditional venues: public speeches and media interviews. There have been a few of those over the past two weeks. 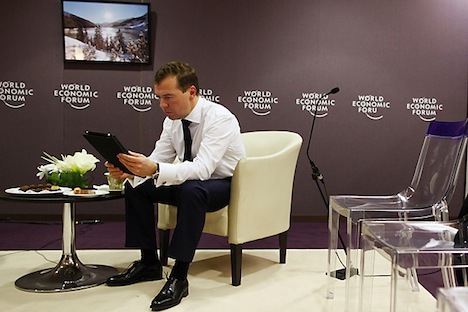 On Jan. 26, Medvedev addressed the World Economic Forum in Davos, Switzerland, and before the trip, he gave extended interviews to Vedomosti and Bloomberg TV. There was one more, unplanned, speech the day before: In the wake of the terrorist act at the Domodedovo airport, Medvedev spoke at the FSB headquarters. Finally, on Feb. 1, Medvedev met with his Council on Civil Society and Human Rights; the transcript of the meeting has been posted on the president’s website. The scope of these messages and their forward-looking content leaves little doubt about their meaning: Medvedev has started his re-election campaign. Four such major issues could be: modernization, corruption, law enforcement reform and child welfare. Medvedev’s modernization drive has its roots in his belief that Russia has already exhausted the natural resources basis for its economic growth. Medvedev easily admits that his modernization efforts have so far produced no “outstanding successes.” Yet, he insists that some “positive things” did happen. Among these, he characteristically mentioned new legislation aimed at regulating industrial technological standards. This is very typical for Medvedev, who, a lawyer by education and experience, is almost obsessed with a legislative “backup” for any reform. Medvedev’s optimism is quite understandable given his desire to deliver a “positive” political message. Yet, he comes across as a bit naïve here. Russian bureaucrats, along with “representatives of different political parties,” long ago learned the trade of never telling the Boss what the Boss doesn’t want to hear. And as far as ordinary citizens are concerned, meetings and demonstrations demanding modernization have yet to take place on the streets of Russian cities. Medvedev can hardly show any “outstanding successes” in his campaign against corruption, either. Moreover, it is possible to argue that there is something almost Don Quixotian in his anti-corruption drive. Medvedev reinforced this image when he recalled, in the Vedomosti interview, that he was advised, early in his presidency, not to take on the issue of corruption. His advisors correctly pointed out that corruption couldn’t be really tackled within the span of a single presidential term and that the inevitable lack of results will only create a mismatch between president’s promises and the reality. Nevertheless, Medvedev decided to take on corruption anyway. Medvedev’s willingness to address difficult issues that are unsolvable in the short run may appear counterintuitive, almost irrational, given that he’s running for re-election. Yet, there is something intrinsically pragmatic, commonsensical in his approach. By pointing to Russia’s long-standing, systemic problems, Medvedev is raising the bar of public expectations of what the next president of Russia will have to tackle. Medvedev’s message is that he is up to the task. Now, anyone running against Medvedev, either in the primaries or the general election, will have to match these expectations. Recently, a new topic has joined the list of Medvedev’s election campaign issues: the guilty verdict in the second Khodorkovsky-Lebedev trial. Interestingly, Medvedev hasn’t tried to avoid the issue in public discussions, as could be expected. On the contrary, Medvedev seems to welcome any opportunity to discuss it. His messaging, however, is somewhat different for external and internal audiences. In the interview with Bloomberg TV, Medvedev went on the offensive and compared Khodorkovsky to Bernard Madoff, but during the meeting with his Council on Civil Society and Human Rights, the word “pardon” appeared, albeit in passing. Moreover, Medvedev has caused a mini-sensation, having requested an expert legal opinion on the Khodorkovsky-Lebedev verdict. Medvedev is certainly aware that the people who care about the Khodorkovsky-Lebedev case will not make or break his re-election bid. Yet those are the people who, should Medvedev get re-elected, will become the most active supporters of his reform agenda. So far, Medvedev hasn’t been talking systematically about the threat of terrorism. Given that Russians seem to have accepted that one major terrorist act will occur every year, Medvedev’s reaction – an occasional speech followed by firing a few middle-ranked officials – might turn out to be adequate. But how will Medvedev respond if the acts of terror in Russia become more frequent? He must understand that in the atmosphere of increasing terrorist threat, voters will reject his modernization agenda and demand a “stabilization” president, which he is not. And all the president’s messages won’t help to put this Humpty Dumpty back on the wall. Eugene Ivanov is a Massachusetts-based political commentator. He blogs at The Ivanov Report.